Serving out a life sentence means obviously that one is not out in society doing all the usual things that people do. Therefore so much of the historic events that took place are viewed by the life sentence prisoner by the medium of TV. TV viewing in the Crum was sporadic to say the least. I entered the Crum in 1977 when the ‘day in day out’ system worked. Republicans one day, loyalists the next. When I say a day out I mean 3 hours out of the cell. Washing in the morning. Walking in the afternoon and TV in the evening. 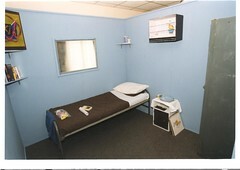 The C wing rec’ room was a large drab room with a black and white TV high up in the wall fixed securely on iron brackets. The room was always awash with noise and tension. I was in the rec’ room one evening when the news came on about a Provo getting a natural life sentence. There was a quietness while the news sunk in to many of us sitting there. Only 4 natural life sentences were given during the Troubles. And I had been speaking to Basher and Billy earlier. 1977. I recall the 1977 FA Cup Final. (21st May) Whether you were a Liverpool or United fan (or other) this was a big match. As luck had it was our day out that Saturday. It was pure escape for 45 minutes on what I recall was a tight game by both sides. No goals by half time. The screws let us see the first half then locked us up for the second half. Nice one. The rest of the match was listened to by radio. For those who had one. 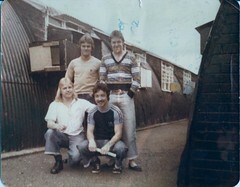 The local connection for us was Sammy Mc Ilroy, Jimmy Nicholl and wee Mc Creery. All United men. 1978. The TV incident of the year for me was the Lan Mon house slaughter. (17th February) By this time I was in Compound 21 awaiting trial. The bombing took place at 9 pm so the TV crews didn’t have time that evening to broadcast the devastation. But C.21 was very news aware and we knew that something very bad had taken place. I was in the middle hut. We had been locked up for the night. We were used to, ‘Here is a news flash’ , remember them? There was a silence to hear what had happened, then a buzz of talk. People went to their cubes to discuss the latest atrocity. The horror of it was very visible the next day. The dead , the injured. The funerals that would follow. 1978. A year to forget. I was given my life sentence later that year. 1980 Iranian embassy storming. (5th May) The TV event of the year for me interrupted watching Alex Higgins in the final of the Embassy World snooker Championship in Sheffield. Out of the blue the live coverage was disrupted by events unfolding at South Kensington, London. We knew of the siege but no one had seen what was coming. The hostage takers had executed one hostage and dumped his body. A group of us stood around the TV in the middle hut wondering what was going on. It was no surprise when the news came through that all but one of the 6 terrorists had been killed. It was a stunning success. All but one of the 26 hostages were rescued. 1981. ( 5th May. ) Those of us in the cages or compounds had Special Category Status. The British government had recognised the special nature of the troubles and granted those involved in the troubles a recognition. 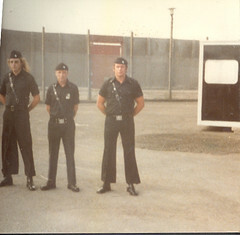 From the Crum’ most of the men, Gusty leading the UVF/ Red Hand group, went to the Nissen hut style POW camp at the Long Kesh- an old RAF air strip. From 1976 there was a process of criminalisation or the blatant retelling of a plain fact that most of the paramilitaries were not criminals but those involved in inter communal conflict. The H blocks kicked in around 1976. Various protests, no work, no wash and dirty had taken place. There was only one protest left to bring the situation to a head. We were all too aware that was happening over the wall in the H Blocks would touch us sooner or later. I recall that brinkmanship was the order of the day. There had been one abortive hunger strike. Surely Sands would not die? I was up at 7am on the 5th of May. I took the only radio out of our middle hut to the study hut so that I would not wake anybody. I put Radio Ulster on and it didn’t take long. Belfast was alight after Sands had died in the early hours. The rest is part of our sad history. There wasn’t a mummer in the cages. 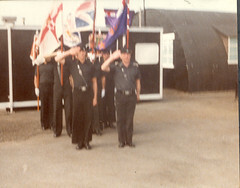 1982 (23rd May) HMS Antelope. The Falklands war was a TV war. We often watched the 9 o clock news to see what had happened that day. There was one TV between 30 men. We would stand and listen before heading off to our cubes. There were many iconic images from that summer ; the HMS Coventry, HMS Sheffield, Sir Galahad. The Belgrano. We got used to John Nott, Brian Hanrahan and of course Maggie. A quiet year. Marking time. 1983. 25th September. 1983 was a strange year. The new romantics were shuffling of the stage while synthpop was making inroads. It was a year of mixed music with UB40, the Police, and Human League all hitting the musical heights. Sinn Fein were on the rise with Gerry A winning west Belfast. George Bush and wife visited Dublin while his government sent Cruise missiles to Greenham Common, England. The cold war was heating up. The prison was relatively quiet after 10 republicans had starved themselves to death. It was a good summer with days spent in shorts and sandals. 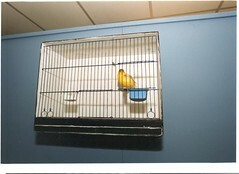 There was no immediate indication in the cages that something big had taken place ‘across the wall’. Sunday was always a quiet day in the cages. No visits, no classes, no football. We didn’t even hear the shooting that took place. But the news soon caught up with what turned out to be one of the largest British prison escapes. One of the consequences was even tighter security. For everyone. 1984. 6th March. The Miners’ strike. Our numbers were starting to drop. A new name has started to enter our discussions. Apparently there is a brand new super prison that’s going to open at Maghaberry. Another disused airstrip. Is there not enough prison sin our wee country? Ronnie Reagan came to Ireland and John stalker was looking at the shoot to kill. The prisons had gone of the front page. Big Benny Redfern from Compound 17 died during an escape attempt in the cages. 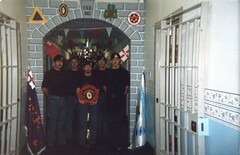 Many of our men were entering their second decade in prison. Another power conflict was being played out in mainland Britain. It had the air of a war that moved on a daily basis. Arthur Scargill became the love him hate him figure beloved of the printed media. 1985 13th July Live Aid. 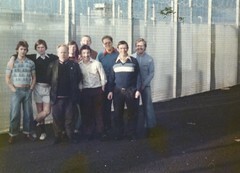 The last of the fixed sentence men left the compounds. 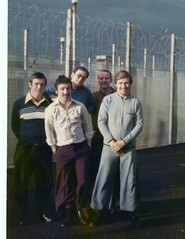 6 had been sentenced to 20 years each in 1975. We were left with only lifers. The prevailing mind-set was that we were all staying until the troubles stopped. However this year seen 2 juvenile lifers being taken to the Crum to prepare for release. Did a chink of light just come on? I had my first case review. I got knocked back 2 years. The prevailing mind-set was that we were all staying until the troubles stopped. We all had done something to raise money for Live Aid. Make handicrafts and sell them. Money sent to charity. 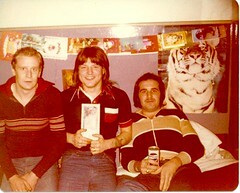 We did watch Barry Mc Guigan win the world title. Nerves wrecked. But the13th July was a glorious Saturday. Up early and to the gym to get training completed. An early run. And it was an early start. A long day of good music. A great excuse to sit in front of the box all day. Quo. Bowie. Cars. Queen. Even better we could watch the American part later on that evening. 1986 January 28th. Challenger disaster. I recall the day as being bright and dry. The Mad Major ( our term of endearment) had called me in and said ‘did you see that’. I was into the whole space thing. This was through the day. Could not believe what we were seeing on TV along with the rest of the world. A strange year. Men were getting their cases reviewed but the sting in the tail was getting a 2 year knockback. I declined mine. What was the point? A long year that seen our numbers drop as some men voluntarily left to go to the dark side- the H blocks. The Sticks (official IRA) had already gone to the Crum because they were down to single figures. I got my degree this year and started on my Honours. 1987. 8th November. The year starts with all sorts of rumours about the end of Special Category. There are tensions as some men are due for release. Others are not. I got another case review, I didn’t go out. I got put back another 2 years. Most of us carry on training, studying and completing handicrafts. Much of it is now at a very high standard. Some have gained qualifications in football , coaching and athletics. The Remembrance Day slaughter hits the world headlines. I recall Maggie T being there in Enniskillen. Hardly one of the main arenas for the troubles. Some of us wonder was it a deliberate act of revenge for what happened in Loughgall on the 8th May. There is a feeling of going backwards. Some men wonder what impact these outside events will have on reviews? 1988. 19th March. A year to change everything. I had just spent my 11th Christmas in prison. The NIO had deniable talks with the prisoners in the cages. A gentleman’s agreement. Leave the Nissen huts, the jungle of razor barbed wire and go to the H-Block and out you go. After a new set of reviews, of course. Bit of a trust issue there but it was agreed by the large majority. We ended up in H2. There were 3 events this year which just rolled into one. First Gibraltar, (6th March), then Stoner at Milltown (16th March). Then the true horror of what had been happening for years. Savagery, barbarity, madness, suffering, death. Two (more) humans are killed in broad daylight for the world to see. Were things getting better or worse? 1989. 9th November. I was in the H Blocks but I had been granted, like most others, Christmas Parole. Amazing. The world seemed to be changing with ours. The writing was on the wall. Special Cat’ aka Political status, was ending. A new world waited. I was transferred to the Crum to prepare for release. My focus was on my family and settling back in but the Cold war had loomed large and heavily over all of us on the ‘80s. Yet here was a clear symbol of division becoming redundant. The Berlin wall was breached. People crossed through unharmed. Time magazine said it was an unparalleled year. South Africa, China, Iran, Poland. The world had changed. The Berlin wall was down. The walls that had held me for over a decade was also down. I came out to a different world in so many ways.